Another beautiful mild day in the midsouth on a Saturday so of course we're going to fence inside! The tournament: the Tennessee State Games Fencing Qualifier - held at MUS (Memphis University School). 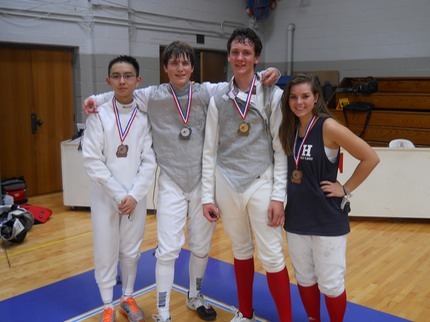 Aside from winning a typical fencing medal and bragging rights, the top 3 fencers earn a right to compete in the State Games of America: to be held the first week or so in August 2013 in PA! 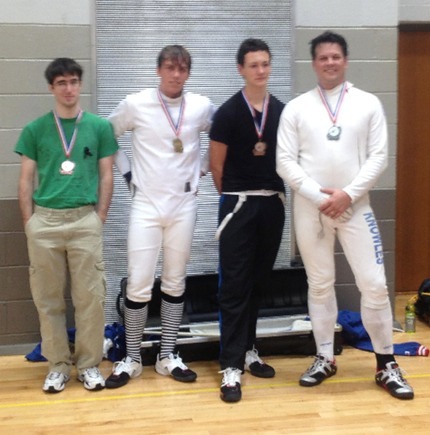 Many fencers from the Memphis Fencers attended - and several were victorious!! FOIL - In the first event of the day, Foil was being contested. There wasn't a large crowd of fencers but the competition was fierce. 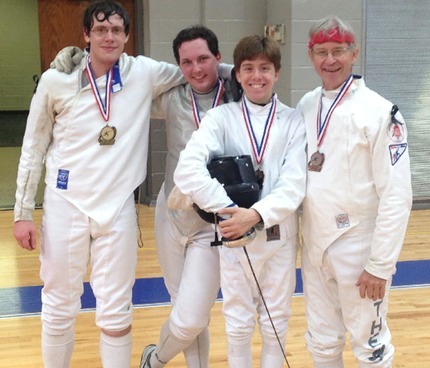 Memphis Fencers Assistant Coach Mark Pinkston was in the thick of the Foil battles and fought his way to a 2nd Place position, assuring himself of qualification for the 2013 State Games. 2nd from the left: 2nd place winner Mark Pinkston! EPEE - 22 competitors entered and fought fiercely to the end. It was rated as a C1 event. This means ratings were awarded to 8th place. Many Memphis Fencers competed in this event and our competitors fenced hard!! Congratulations go to Coach Tom Knowles for achieving 2nd Place after a fierce DE while Alexander Fader and Nate Phillips tied for 3rd! Way to go guys! Congratulations also go to Mark Pinkston (8th), Hudson Parish (13th), Will McCormick (14th), Sam Melson (15th), Alex Merino (16th), Phillip Geyer (17th), Ryan Gauvin (20th), Piper Bailey (21st), Drew Bailey (22nd). Great job for competing and striving as hard as you all did! Our September edition of the popular 'Get-Your-Rating' competitions (GYR) was another Epee event and the first place winner earned the first level rating of an 'E'. After fighting his way through his pool and then several DE bouts, our winner was MITCH RAYL of Arlington High! A lovely Fall day and the weather outside was a beautiful, sunny 72º with puffy clouds filling the skies. Local and regional fencers gathered at the Memphis University School (MUS) to hold a fencing tournament in Foil, Epee, and Saber. 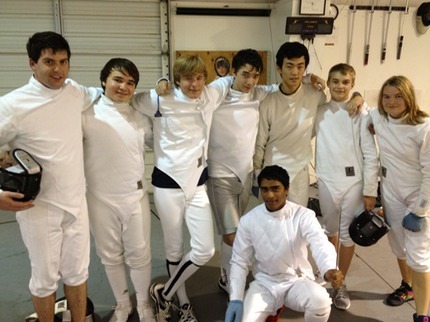 Many fencers from the Memphis Fencers attended - and were victorious!! FOIL - The first event was Foil at 8am and although it was small, the fencing was still fierce. Alexander Fader came out on top in First Place while Tierney Linville tied for 3rd. WAY TO GO, Alexander and Tierney!!! EPEE - The second event was much larger - 25 competitors - and it was rated as a B2 event. This means ratings were awarded to 8th place. Many Memphis Fencers competed in this event - some for the first time. Our competitors fenced hard and learned a lot - and several were victorious!! Congratulations go to Nate Phillips for achieving 2nd Place and earning a 'C' rating in Epee!! Alexander Fader placed 6th and earned a 'D' rating while Hudson Parish also earned a 'D' in Epee for coming in at 8th overall. Way to go and to earn those ratings!! Congratulations also go to Alex Merino (17th), Sam Melson (18th), Piper Bailey (19th), Devin Geiger (21st), Drew Bailey (23rd), Kaz Guenther (25th). Great job for competing and striving as hard as you all did! SABRE - The last event our fencers were in was Saber. Nate Phillips, who placed 2nd in Epee during this competition, competed in Saber and went on to fight vigorously for SECOND PLACE in Saber as well!! Congratulations NATE PHILLIPS!! Once again, a small number of competitors met to decide to who would rise to the top and earn the first level rating of an 'E'. 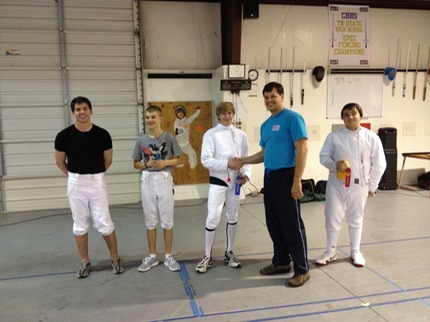 This time the event was Epee and our winner was DEVIN GEIGER of CBHS Fencing! Congratulations to Devin Geiger of CBHS Fencing!